When is it safe to let my puppy outside? Is it safe for my puppy to socialise before completing vaccinations? I asked these questions frequently and hope to answer them here. Puppies need to start experiencing new things from the day you get it home at 6, 7 or 8 weeks. To isolate your puppy in a home environment until it has completed its full course of vaccinations could cause major behaviour problems later in life. A high percentage of adult dogs that are referred to me have varying degrees of fear behaviour, from shying away or freezing when someone puts their hand down to touch them, to full on aggression, barking, growling, lunging, bitting if they can. Bad behaviour in adult dogs can be caused by bad experiences or by a lack of socialisation at an early age. Socialisation is an extremely important phase in the puppies development and there are things that you should be doing until your puppy has finished the vaccination course. Use your imagination and get your puppy out and about! So take your slippers off and get out there! 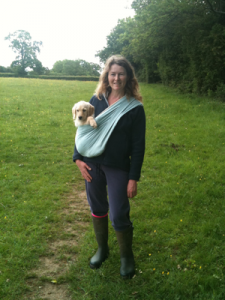 A client sent me this picture with the message, “I knew I’d get to use that sling again one day! Are you concerned about your puppy's safety outside? 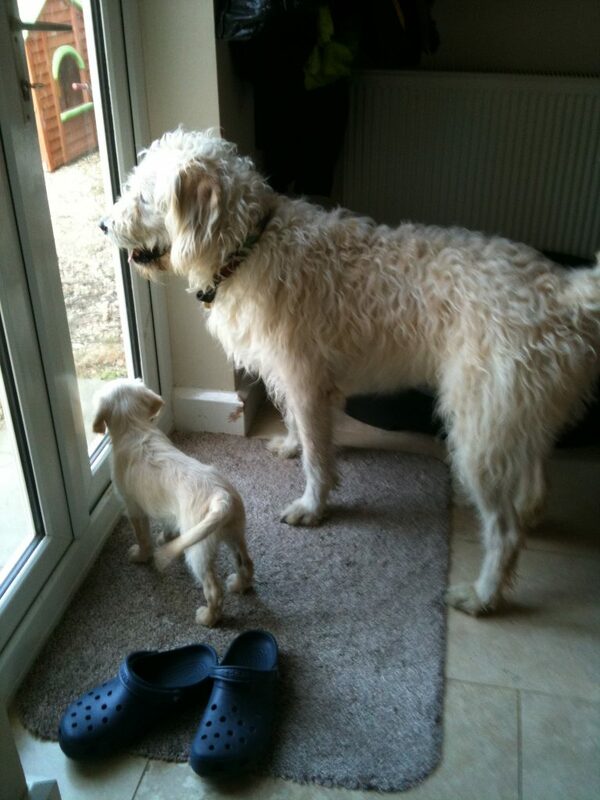 Get in touch and let me know about your puppy and your concerns about its early socialisation.